>>>This book is written in English only. With brisk economic and cultural activities, Seoul is a dynamic city full of energy and vitality. Moreover, Seoul has been changing into an environmentally friendly city even as its global frame has increased. In particular, the Cheonggyecheon Stream, covered over with an urban expressway during Korea's rapid industrialization in the 1960s, was successfully restored in October 2005 and is shown vividly and beautifully in this book. 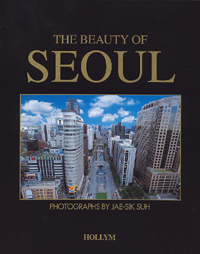 Through this book, readers will experience the charm, grandeur and lovely views of Seoul. Also, the book's in-depth explanations about Seoul's history and culture with its color pictures will give the readers a better understanding of Seoul. Jae-sik Suh, the photographer of this book, is a well known photographer who has published widely and has won a number of prestigious award both nationally and internationally. Currently he is working on "The Thirty-Year History of Pohang Steel."